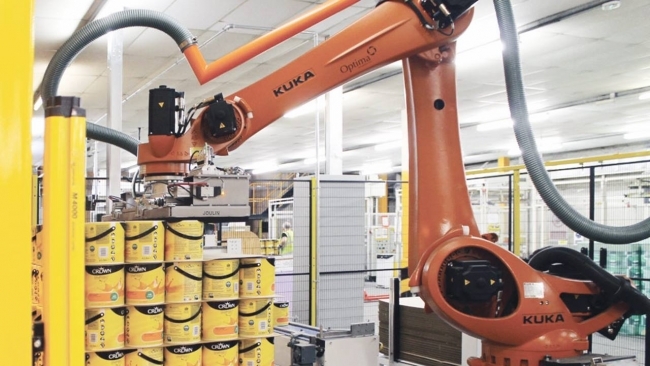 At its main production plant in Darwen, south of Blackburn, Crown Paints uses a KUKA palletising robot from the KR QUANTEC series for palletising pots of paint. In addition to Darwen, Crown Paints also has a production plant in Hull and operates 130 paint and wallpaper outlets throughout Great Britain and Ireland. The paint manufacturer was looking for a solution to boost productivity during the palletising of paint pots while also ensuring reliable quality and enabling flexible selection of the products. The wide-ranging expertise that KUKA Robotics has acquired in many different sectors and branches of industry, such as the automotive sector, was a convincing argument for Crown Paints. The company opted for a robot-based automation solution developed jointly with local integrator Optima Control Solutions Ltd. This solution is centered around a palletising robot from the service-proven KR QUANTEC series. The robust design and the powerful gears and motors of the KR 180 R3200 PA from the KUKA KR QUANTEC series enable palletising operations with up to 27 cycles per minute. With its streamlined base frame and small footprint, the robot requires very little space. These criteria were of central importance for Crown Paints when it came to selecting the appropriate robot. Paul Feldwicke, Maintenance Support Manager at Crown Paints said, “Following its smooth installation, the robot now enables a safe and uninterrupted production process. The robotic automation has not only enabled the company to boost the productivity of the overall system considerably, it has also significantly improved reproducibility and flexibility with regard to different paint mixtures. Thanks to the positive results of introducing robotic automation to the company’s palletising operations, which are important for the entire process chain, Crown Paints is now considering using additional robots in the future.